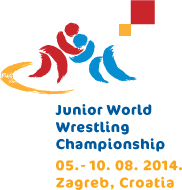 Three Alberta athletes represented Canada at the 2014 Junior World Championships in Zagreb, Croatia! All three placed top 10 in their weight divisions! Amber Maschke (55 kg, Bears Wrestling Club) and Temitope Ogunjimi (63 kg, Dinos Wrestling Club) battled their way to the bronze medal match, both placing 5th, just missing out on the podium. Cara Nania (51 kg, Dinos Wrestling Club) secured a first round fall against a tough opponent, facing the eventual bronze medalist in the next round and ultimately finishing in 8th place. Congrats to all our Junior athletes!